Praise for Blind Spots "Shelton's open and candid style inspires trust among readers. Management teams and those making career choices can push their effectiveness up a notch with her skilled approach to facing blind spots and moving beyond them." 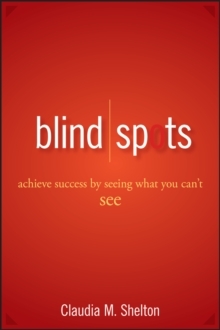 -Rick McNutt, Executive Vice President, National City Bank "Blind Spots gives individuals a comprehensive, but very manageable, set of tools and strategies to see themselves differently. The stories of people whose lives have been changed by Shelton's principles and techniques enhance the strategies she presents. This is a compelling book with the power to improve lives dramatically." -Eleta A.
Jones, PhD, LPC, Assistant Director, Center for Professional Development, University of Hartford "Shelton's approach to identifying blind spots goes to the heart of effective leadership. Such interest arose from this work that requests poured in for not only follow-on training regarding Blind Spots, but also for developmental coaching. Six months later, people are still talking about Blind Spots. "-Jack Bergquist, Vice President, Kaman Aerospace "When I recognized my blind spots that made me underestimate my entrepreneurial strengths, I was able to move forward to launch a successful company. This book is a must for building resilience to face the challenges of a start-up." -Marilyn Nemarich, entrepreneur and owner, Marilyn's Pies "This book can teach you how to see inside yourself. As I was reading it, I kept thinking of the song On a Clear Day You Can See Forever. Learning about your blind spots leads to clear sight, which can create possibilities for innovation and growth." -Jane Hunt, Assistant Vice President for Executive Development, The Hartford Financial Services Group, Inc.